Are you seeking a little sunshine? Heading for the slopes? Ready for a little getaway? Whether it is five miles up the road or an adventure to a distant destinations, there is nothing we love more than a little vacay to take you away from the everyday. With spring break just around the corner, we’re ready to spend some time feeding that wanderlust bug. No matter what your age, there is truly something amazing about reading or seeing a destination in a book or online and then seeing it come to life. As you know, prints and patterns color our world here at Matilda Jane and we can’t help but correlate that with the colorful life that is brought through one’s adventures in the world! 1. Give yourself time. Our number one tip – giving yourself extra time will give you peace of mind when it comes to traveling. Give yourself time to plan. Give yourself time to pack. And definitely, give yourself time when hitting the road or traveling to the airport. Aaaand, you know us, we love to be a little unpredictable…so leave a little room for the unexpected. Sometimes life just calls for a wrong turn, the scenic route or even cake for breakfast! 2. It’s game time. I think Mary Poppins says it best, “In every job that must be done, there is an element of fun.” One way to make planning fun is to turn packing into a game. A packing checklist is always the perfect way to make sure nothing is left behind and we’ve designed a pretty printable to help you with just that. Set your packing game to fun tunes and let their imaginations swirl about the fun coming with their upcoming adventure. This not only helps them in the future (boy do they grow up fast, I’m not crying…you’re crying), but it also helps prevent anxious feelings they might have by allowing them to help prep for a big trip. Another way to engage with your littles before you leave would be to help them learn about the adventure that awaits by reading a story about your destination. Older children can be more involved in the planning process by doing their own research and sharing their thoughts on places to see and things to try. Use our bucket list printable to capture their trip daydreams. And, don’t forget to countdown! Nothing creates more excitement than the use of a calendar or something crafty to countdown the your departure. The days before the trip can be just as magical and fun as they imagine the adventures that await. Pro Tip: Bring your packing list with you on your trip to make sure all of your items make it back home. 3. Be prepared. Traveling with kiddos keeps you on your toes, am I right!? Well, this is where it is always a good idea to evaluate and see just what might be your lifesavers during your commute. You never know when you are going to need to pull out a wardrobe change, snack, travel games or a sweet snuggly to turn a frown upside down. We love the idea of pulling together a travel kit for each child complete with their favorite snacks, games and activities that they can grab when they need it – another great way to foster independence during your trip. No matter the age, having a quick favorite snack and easy travel activity is a must and will help make the trip that much smoother. 4. Less is more. One of the things that we love most about the collections our designers dream up are the possibilities for dressing your cuties from their bows to their toes. One of our favorite packing tips is to select pieces that can be mixed and matched throughout the trip to create new outfits. Add in accessories and layering pieces to create even more variety and to manage those changing temperatures on planes, after a long day in the sun and in restaurants. 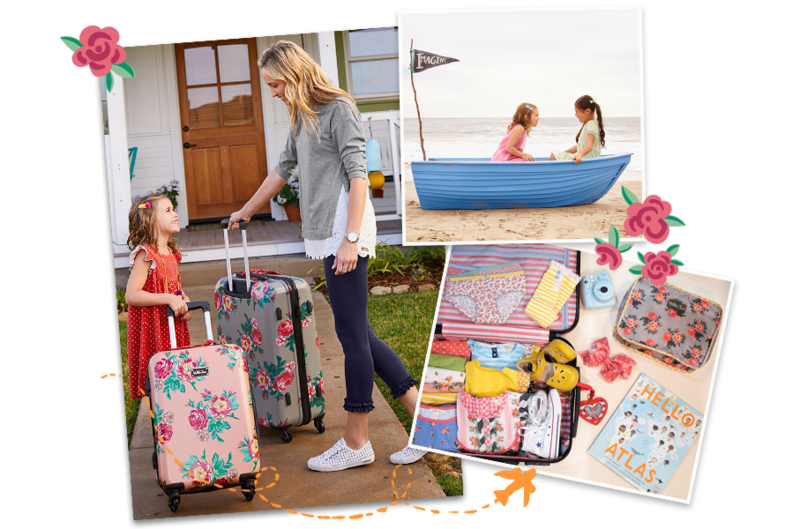 Whether it’s for you or your little one, the ability to create multiple looks is the key to traveling light and having everything you need. Pro Tip: Rolling, not folding will definitely maximize your space, minimize wrinkles and leave extra room for those fancy little finds that might make it home. 5. Enjoy the ride! There is nothing as special than making memories with the ones you love. Don’t forget to relish all the little in-between moments as you lose your head in the clouds of your adventure. The memories you make on your trip will be cherished by you and your children for a lifetime. To capture all the great stories, we’ve included a journal printable for your little one to write or draw about their adventures during your trip (another great way to keep the littles engaged during any downtime). So as you escape the ordinary for the extraordinary, we hope these little nuggets of knowledge and pretty printables help you and your loved ones travel with ease. We can’t wait to see your plans come to life in your upcoming getaways and be sure to have your cuties share their memories with our journal printable using #matildajaneadventures as a lucky few will win a travel bundle for their next adventure. Will you be one of the lucky few?? ‘Tis the season for rain, snow, warm, cold.. mix and repeat. Oh Mother Nature, just a day can entirely change our wardrobe choices (cue all those MJ layering looks 😉). This weather definitely keeps life exciting, especially with littles in the house with their eager sense of adventure and boundless energy. Sometimes staying snuggled up and at home might seem a bit confining, but never fear, we’ve got some fun ways to embrace these weather events with puddles of fun! Treasure Hunt… Who doesn’t love a good scavenger hunt?! You can plan this activity in a variety of ways – hunt for colors of the rainbow that lead to a pot of gold or write silly clues that lead to your kiddo’s favorite thing hiding in the house. With just a little prep work, a scavenger hunt can engage little minds and develop their inner Nancy Drew. Let’s get crafty (and dance)… if there is one thing we know about keeping a little one busy, a craft is in for the win! And when you add a little dance party at the end, it is twice as fun. All you need is a toy ring and some ribbon to get the party started. Once your cutie has found the ribbons they fancy, simply tie them to the ring. Now, grab those rainbow ribbon dancers, your favorite tunes and find an open and safe space to dance their little hearts out with a game of freeze dance. Just one rule, freeze like a statue when the music is paused. To challenge them, play with the music volume and their levels of movement. Giving them different tasks keeps them on their toes and engaged with the game (if the music is quiet, have them dance low to the ground; if the music is louder, have them dance high in the sky). MJC Pretty Printables… We crafted these pretty printables with your cuties in mind. They are great for rainy days, quiet time or just to keep your kiddos away from the screen. These printables are also a great tool to keep your littles occupied while you shop the day away at your MJC trunk show with your favorite TK. Can you think of a better way to hang with your favorite people, do a little shopping and cozy up all at the same time?! Click here to snag yours today. When in doubt, bake it out… Some of my favorite times growing up have been centered at the heart of the home, the kitchen! In my family, food and cooking were as necessary as breathing. Cooking creates memories that last a lifetime. So pull out your aprons and get cooking on some rainbow themed baking. Start with your favorite cake, pancake or cupcake mix. Divide your batter once prepared and use multi-hued food coloring to turn the colorful fun. Jump on in… Like Vivian Greene says in her quote above, it’s all about learning to dance in the rain. Our designers crafted our pretty rain pieces with twirling and playing in mind. They worked hard to create pieces that look good, feel good and hold up to everyday play. So, get outside in your favorite rain jacket, umbrella and wellies to jump in on the fun. Fort Fun… I think we all have memories of building fantastic forts growing up as kids. They had to be just right and stocked full of pillows, blankets, flashlight and snacks. What better way to relive this adventure than with your little ones. Use your Matilda Jane blankets and quilts to design pretty, patterned creations – forts never looked so good! Don’t let cabin fever set in when the weather is grim. These activities might just be the perfect way to add a little homemade sunshine to a cloudy day! 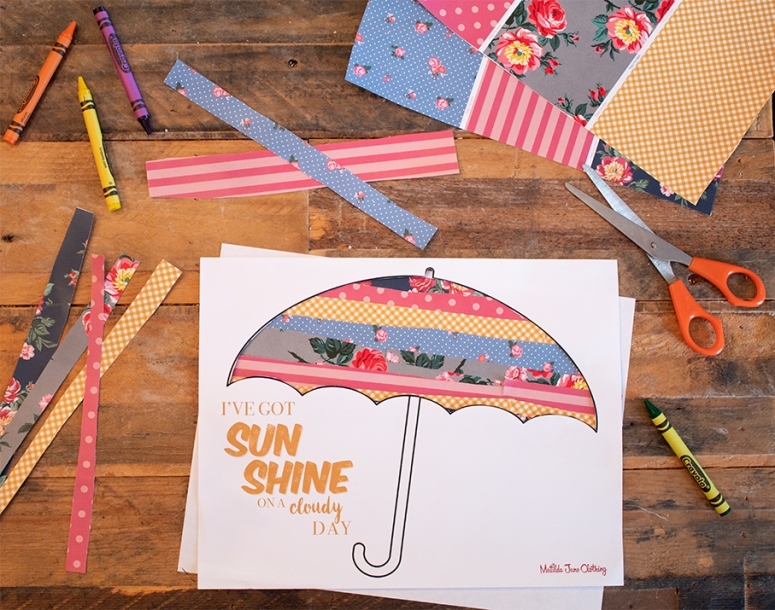 Be sure to tag us at #matildajane as you bring these rainy day adventures to life in your own home.